What is a bear? Where do bears live around the world? Could they be living in your neighborhood? We’ll look at the major bear species of the world in general and then focus on our own Florida Black Bear. This bear is our state's largest mammal and, sadly, is on Florida's threatened species list. 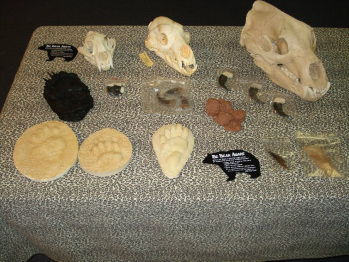 Bill and Merilee Clifton, creationists, authors, Florida Master Naturalists, and science educators will help your group learn about the wonderfully designed world all around us. The Cliftons will personally lead your group in each workshop providing a unique and fascinating perspective of God’s great design in Creation. Minimum number for each workshop: 40. Maximum number for each workshop: 80. Cost for one workshop: $7.50 for child or adult, 5 years and up; free for 4 years and under. Minimum charge for one workshop: $300 (if you have less than 40 participants). Cost for two workshops: $12.50 for child or adult, 5 years and up; free for 4 years and under. Minimum charge for two workshops on the same day: $500 (if you have less than 80 participants). Creation Adventure workshops are usually scheduled on Thursdays or Fridays, but there are a limited number of other open dates listed on the web site calendar. Tuesdays are generally ﻿﻿unavailable ﻿﻿due to weekly homeschool science classes. One Friday each month is also unavailable due to monthly high school Marine Science at SeaWorld classes. To visit our website calendar and check for available dates or currently scheduled adventures, click here. CONTACT MERILEE CLIFTON at 407-808-4458 (cell/text) or sciencepartners@cfl.rr.com with any questions. Join our "The Bear Essentials" workshop on Friday, September 21, 2018.